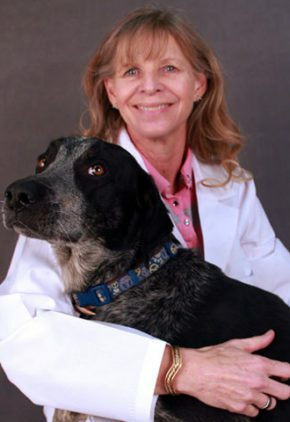 Dr. Cheryl Agent became a veterinarian after a career in hotel management. She’s been an emergency clinician ever since and is particularly interested in toxicology. Dr. Agent’s favorite pastimes include playing with her grandchildren, horseback riding, hiking and traveling. She has an Arab gelding; three aussie mixes, Kit, Kord and Kade; and one fat cat who completely rules the house. Dr. Amy Auwarter is particularly interested in metabolic disorders, neurologic disorders and integrative care. Dr. Auwarter spends a good amount of time working on her historic home. She also likes cooking and eating, traveling and yoga. Her pets include cat Fiona, and dogs Violet, Rosie and Molly. Dr. Allison Biddick's clinical interests include trauma, mechanical ventilation, sepsis, immune-mediated diseases and fluid therapy. She's also passionate about educating others. Dr. Biddick likes watching Oklahoma Sooners sports, OKC Thunder basketball, visiting the ocean, and do-it-yourself projects. 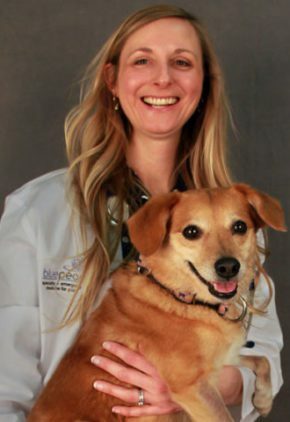 She has four dogs: small mixed breeds Trixie and Toby, American bulldog T-Rex, and lab mix Queen B.
Dr. Linda Blair enjoys all aspects of emergency medicine. 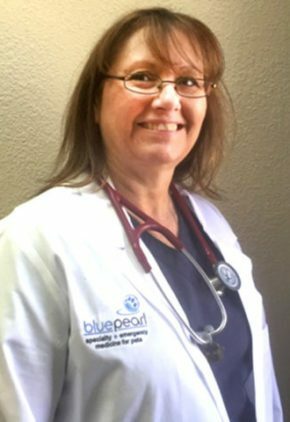 Dr. Blair likes watching her son play hockey, riding hunter/jumper horses with her daughter, mud adventure races and time on the lake. Nikki is the family dog, and they also have two cats, three goats, a chinchilla and a dozen big goldfish. 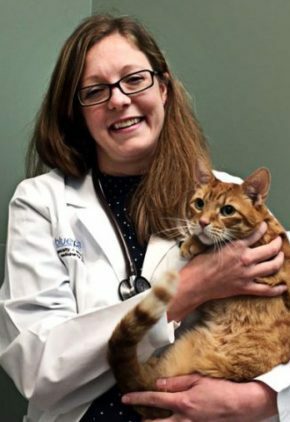 Dr. Jesse Bullock enjoys the classic emergency cases - meat bones stuck in lower jaws, male cats with urinary issues, and even vomiting and diarrhea - but she especially likes toxicity cases. Dr. Bullock likes to unwind reading the latest science fiction/fantasy, trying new recipes and quilting. She has two cats, Killer and John Doe. 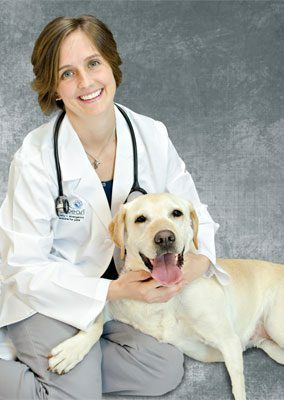 The daughter of a veterinarian, Dr. Carly Czuba enjoys the challenge of stabilizing and managing critical cases. She also has a clinical interest in veterinary dentistry. Dr. Czuba likes running half marathons, playing ice and street hockey and challenging her husband, a pediatric critical care physician, to a game of golf. They have two cats, Garfield and Potato. 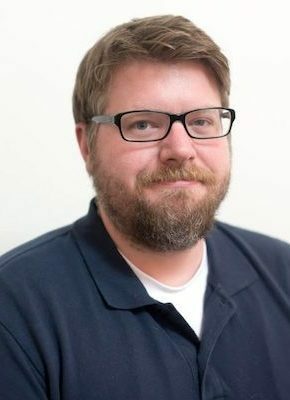 Dr. Bryan Eason's clinical interests include congenital heart disease and how medical, surgical and/or interventional therapy may be used to help manage these cases. 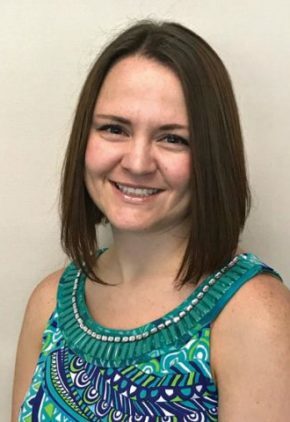 Dr. Megan Edwards particularly enjoys resuscitation and stabilization, and treating endocrinopathies and metabolic disturbances. She even admits to loving the more gruesome bot flies and abscesses. Dr. Edwards' relaxing pastimes are cooking, reading and watching movies, and her more rigorous include hiking, camping or traveling. Her pets are rat terrier Brynn and dachshund mix Sandia. 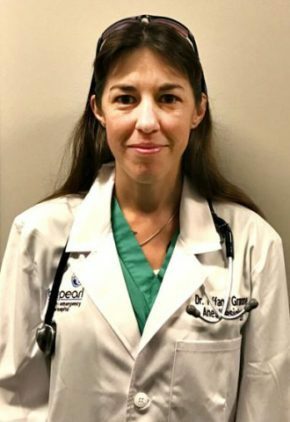 Dr. Tiffany Granone came to BluePearl after almost five years as an assistant clinical professor of anesthesiology at the University of Florida. She has a particular interest in the use of anesthesia in critically ill patients. Dr. Granone enjoys exploring the outdoors, including fishing and boating, as well as cooking and exploring different restaurants. She has three dachshunds, a Lab mix, a Caribbean island dog and an orange tabby cat. The fast pace of emergency and critical care medicine, as well as the diversity and complexity of the cases, are Dr. Aubrey Hnatusko's favorite aspects of the field. Sepsis, diabetic ketoacidosis, hypoadrenocorticism, and fluid therapy are some of her particular clinical interests. Dr. Hnatusko loves country music, two steppin’ and cheering on the OSU Cowboys. She also enjoys running, reading, and trying new restaurants for brunch. Cade and Kenzie are her two West Highland white terriers, who are in charge of the household and keep her on her toes with their terrier antics. Dr. Jennifer Jaycox worked for many years in private practice. 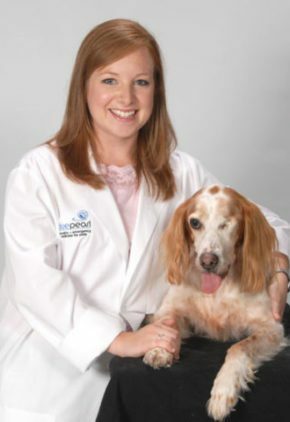 Her particular interests include canine internal medicine and infectious disease cases. 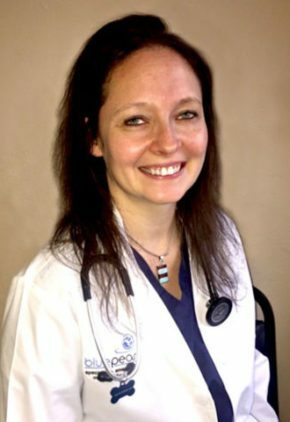 Married to her high school sweetheart, Dr. Jaycox and her husband have a houseful of pets: a few fish, Boston terrier Lola, Siberian husky Odin, and three snakes - a western hognose, an Argentine boa and a Pueblan milk snake. An outdoor lover, the zoo is her favorite place to take a walk. Dr. Curry Keoughan became interested in orthopedics and surgery in middle school and still considers orthopedic surgery his favorite. Board certified in large animal surgery, he has received extensive training in the field, been a clinical instructor at the Virginia-Maryland Regional College of Veterinary Medicine, and worked around the world to include being the equine veterinarian for the crown prince of Saudi Arabia, and a senior surgeon in Singapore. 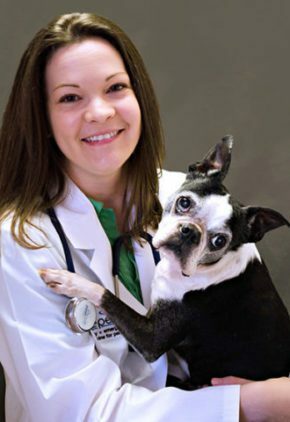 Dr. Keoughan is currently in a small animal surgery fellowship. Dr. Keoughan enjoys sailing, reading, renovating his house and building things. He and his wife, who is also a veterinarian, have three daughters and one son. The family has three dogs, Roxy, Sandy and Lady, and cats Halo and Tinsyl. Dr. Jodie Lamb's clinical interests include elbow, shoulder and knee arthroscopy, and hemilaminectomies. Dr. Lamb likes to read, cook and watch movies with her husband and daughter. They have a yellow lab named Maggie who loves duck hunting. Dr. Rebecca Marchwinski is part of our emergency medicine training program for clinicians. Dr. Marchwinski enjoys refinishing and building her own furniture out. She also loves traveling and taking her two pit bulls, Tucker and Jax, hiking. 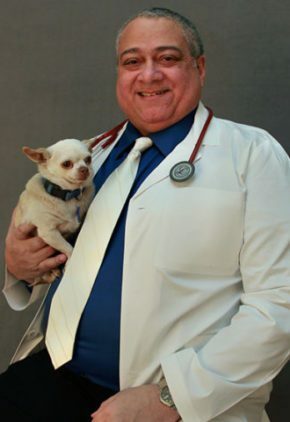 Dr. Robert Martinez particularly enjoys helping pets get through and recover from trauma, such as dog fights, lacerations or being hit by a car. An endurance athlete, Dr. Martinez loves triathlons, marathons, multi-day events and similar activities. He and his wife have one dog. Dr. Brent Newcomb’s special interests lean toward orthopedic and neurosurgery. He enjoys TPLO and tightrope procedures for cranial cruciate stabilization, fluoroscopy for fracture repairs and percutaneous laser disc ablation for the prophylaxis of disc herniations. A volunteer worship pastor at his church, Dr. Newcomb is married and has a daughter. He loves hunting, fishing, skiing, hiking and camping. The family's long-haired dachshund is named Wendell. Dr. Frank Roberts has worked in mixed-animal practice, as an adjunct professor at Oklahoma State University, and in small animal practice. He is particularly interested in clinical pathology, soft tissue surgery, such as laceration repair, and foreign body exploratories. 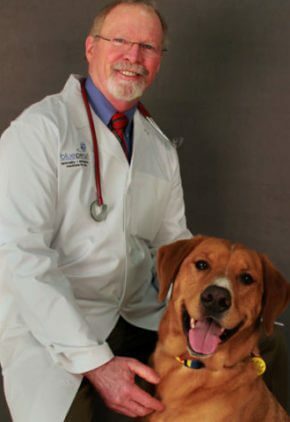 Dr. Roberts has three, Weimaraner Percy, Chihuahua Gus, and golden retriever Duke. Despite his size, Gus is the boss of Percy, and Duke steals the heart of every household visitor. He enjoys cooking, going to the movies, camping, hiking and target shooting. His son is in the Marines, and his daughter is a registered nurse. Dr. Lana Rothenberg has a particular interest in hematology, immune-mediated and endocrine diseases. A vegetarian for more than 20 years, Dr. Rothenburg volunteers for the Toronto Vegetarian Association and is excited about her vegetable garden. Other hobbies include ashtanga yoga, camping and running. 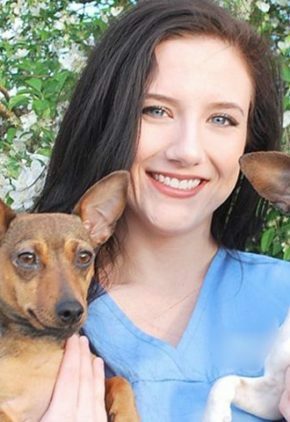 Dr. Macy Schneeberger is a small animal medicine and surgery intern. 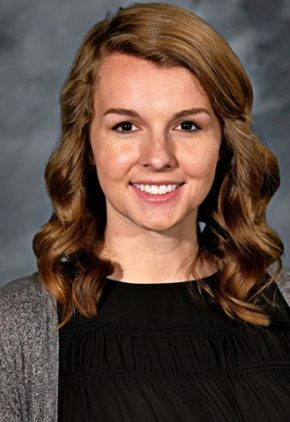 Dr. Schneeberger can be found trying out local restaurants and coffee shops if she’s not out hiking or walking her pit bull Josie. She also has three cats, Piper, Chunker and Carol. 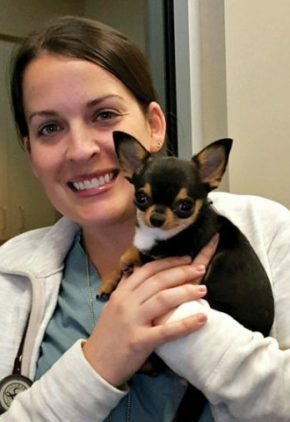 Dr. Luann Stinnett is a small animal medicine and surgery intern. Dr. Stinnett likes to travel, read, hang out by the pool, attend musical theatre, and walk her dogs. Daffodelia is her golden retriever mix, and Copper is her beagle. She also has two cats, Solitair and Hampton. 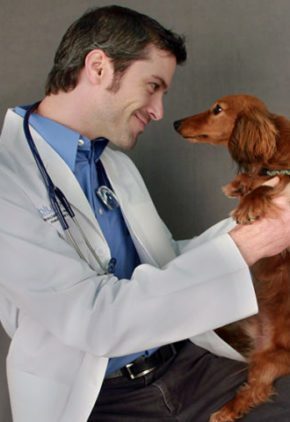 Having practiced veterinary surgery for many years, Dr. Skip Tangner enjoys and feels comfortable with all aspects of surgery and is gratified by any procedure that restores function and eliminates pain. Fond of all things family related, Dr. Tangner can also be found in athletic pursuits like biking, weightlifting and spinning and in more relaxed pastimes like bible study and catch-and-release fly fishing. Willard is his big red dog. Dr. Rebecca Tims’ particular clinical interests include infectious and immune-mediated diseases and cancer treatments. She is also excited about the continual advances in minimally invasive procedures. Dr. Tims spends her time away from the hospital with family and friends, fishing and hiking with her dogs. Tucker is a dachshund mix; Lola a terrier mix; and Socks is a powder puff Chinese crested. She also has a male cat named Juanita.